Right on Cecil. My mentor in the early 70s had me shoot almost exclusively the High Standard 106 Trophy. And mostly slowfire. My first 45 was an original GoldCup NM, CMP complying. My first revolver was a Colt OMM 38. Coach Miller still did not emphasize the 45 or revolver too much. But he did say shoot them and have fun. 2.7 BE and 3.4 BE in them. My personal goal is to make the Navy Marksmanship Team, so I have a lot of work cut out, but that's the easy part. I enjoy the club level events, which are indoor weekly, but not a full NMC (22 and 45 only). I'm working hard and the goal is to shoot to best of what I am capable, if that means Expert/Master/etc. so be it. The only events I'm obsessing about are Fleet level and the inter-service in the Spring and in the future, my personal goal is in 2 years, I want to shoot at Perry as part of the Team. My command is supporting so the only limiter is my level of effort. So I guess I'm a little more on the intense side so I'm having Dave Sams build my ball and eventually a wad gun. I have about 4 years before sea duty again so I need to get moving and get moving quick because once I go back out I won't have the ability I do on shore duty to achieve what little performance I've gained. I'm lucky to have 2 high masters in the club I shoot with and I'm taking full advantage of their advice and support. Once I get done with some schools for the military I'm going to also shoot air pistol based on their recommendation. So that will give me a weekly club and air pistol event with my daily dry fire (30 minutes). I'm also starting the USMC training guide based on the advice of some excellent service shooters. There is a pretty big following in your area. Making the Team is not a big deal (hopefully they will have a "team" next year) Dry fire and goals is one of the hard things to set down. Do you reload? If not you need to add that to your list of things that must be mastered. This forum is a great place to start. Crane had a couple of really talented pistolsmiths. If they have not been "let go" by budget cuts they can build you a really nice pistol and you only need supply some of the parts. Do you know the USN marksmanship team contacts? Motorcycle_dan wrote: There is a pretty big following in your area. Making the Team is not a big deal (hopefully they will have a "team" next year) Dry fire and goals is one of the hard things to set down. Do you reload? If not you need to add that to your list of things that must be mastered. This forum is a great place to start. Crane had a couple of really talented pistolsmiths. If they have not been "let go" by budget cuts they can build you a really nice pistol and you only need supply some of the parts. Do you know the USN marksmanship team contacts? No reloading yet. I am moving soon and the Navy won't ship powder so I am waiting to buy a Dillon when I get to California. I plan on a trip to TN to visit and load up rounds with my Dad who lives nearby and reloads to get me through the next 6-9 months. I've got Matt Bartel's phone/email since he lives near me and we shot together at 12th precinct. Great guy and a class act. He's absolutely the right person for the job and its a tough one considering he gets very little, make that zero, real financial support. I'll ask around about crane, we have a GMCM who used to work there that should be able to get me in the right direction, but if you have a belly button I appreciate the gouge. As always thanks for he great advice Dan. Simple, Shoot what you have and have fun. Cecil's advice was spot on. Training on just a .22 will get you a LONG ways ahead with less equipment and money invested. You could do way worse than buying a Range Officer Springfield, Take the top off and save it for later. Get a Marvel conversion .22. In my humble opinion get the cheaper non lock back 5" model. You don't need the compensator or the combo rib. Stay with Iron sights until you get distinguished. Buy the Marvel with Iron sight rib then later you can add a weaver mount rib if you choose to go that way. An extra magazine or two would be great idea if you have the extra funds. It makes little sense to spend the money and time to master a .45 until you can keep all hits in the 9/10 rings with rim fire. If I were to expand on Cecil's great advice. Purchase a .38/.357 revolver when the right one comes along. 4 to 6" barrel, Smith Colt or Ruger. Load the cylinder with 4 or 5 empty cases and 1 or 2 live rounds. Spin the cylinder so you don't know where the live round is. Learn to watch your sights during the trigger squeeze. Shooting a box of .38 with only 1 or 2 shots in a cylinder takes a while. But your goal is marksmanship, not turning ammo into noise. I very much like the Nelson Custom 22 Conversion. Exceptionally accurate and I've only seen sensitivity with two types of rimfire, neither of which I would use in a match. With the open sights it is only $420 versus the more expensive $484 for the Marvel. 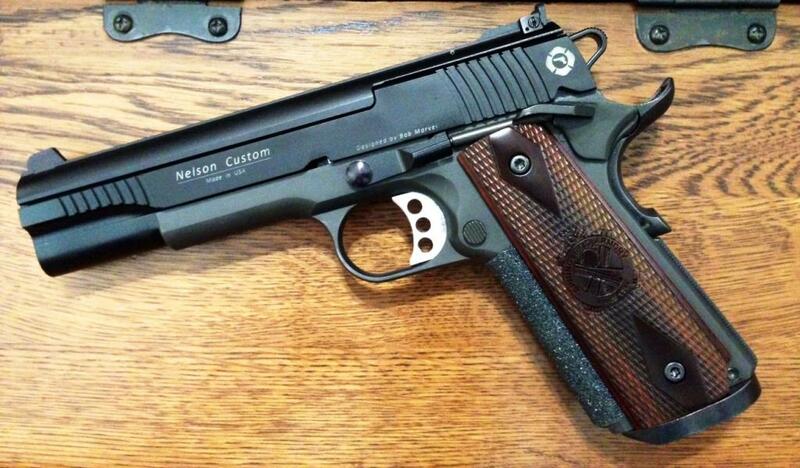 Nelson's conversions are based on the updated design by Bob Marvel, lock back on the last round, and are dry fire safe at no extra charge. My scores went up significantly after using the conversion and I've saved a tremendous amount of money. If I wasn't shooting in service competition, I would still be shooting my RO with the Nelson conversion only. What did you put on the front strap and where did you get it? I got a leftover patch of skateboard deck tape from a skate shop for whopping $4.00. The guy gave me a lifetime supply.